If you like the G0606X1, but don't have the space or need the long rails and extension tables, take a look at this model. 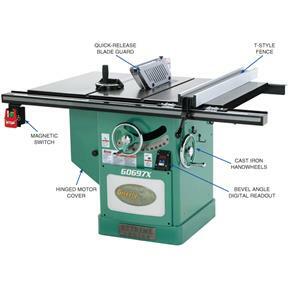 You get the same great features, including a beefy cast-iron table, extension wings, cast-iron hand wheels and trunnions, 4" depth-of-cut, digital bevel cutting readout, left-tilting saw blade with metal guard and full-time riving knife, all in a compact package. So, if you've ever wished for the extra cutting height of a 12" table saw, but don't have the space or need for long rails, these are the table saws for you! CSA certified meeting CSA C22.2 #71.2-08; CSA C22.2 #105-1953 and UL 987 standards! Table height from floor: 35-3/4"
Table size with wings: 30-3/4" x 48-1/4"
Maximum depth of cut @ 90°: 4"
Maximum depth of cut @ 45°: 2-3/4"
Distance from front of table to blade at maximum blade height: 11-1/2"
Approximate shipping weight: 756 lbs. Purchased this about a month ago for production use in a factory. Better than we could have hoped for, and set-up was easy! Q: What is the difference between G0696X and G0697X? A:The G0696X has a 5 HP motor is wired for a single-phase, 220V, 30A power supply circuit. The G0697X has a 7.5 HP motor and is prewired for a 3-phase, 220V, 30A power supply circuit, and can also be rewired for use on a 440V, 15A power supply circuit. Aside from these differences, the two models are identical. 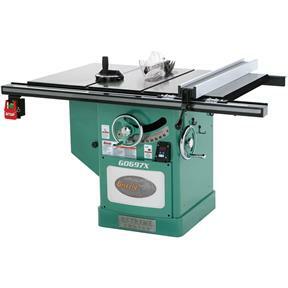 Q: Aside from the extension tables and longer fence rails, are there any other differences between the G0605X1/G0606X1 and the G0696X/G0697X 12" table saws? 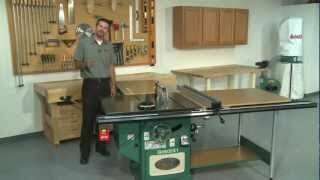 A:No, if you take away the extension tables and fence rails, these saws are identical. Q: I see that this machine is rated for 220V or 440V. Does that mean that I can just connect it to one or the other and it will automatically work? A:No. Although the machine is rated for both voltages, it will be factory-prewired for a 220V power supply. In order to operate on 440V, it must be rewired and some of the electrical components must be replaced. If you require 440V operation, Grizzly must convert your machine at the time of purchase to maintain the machine's warranty. To facilitate the 440V conversion, a $250 fee will be added to your order and extra shipping time will be required to make the conversion. Additionally, Grizzly can supply a 440V conversion kit for customers who have an "as-is" or "second-hand" machine they purchased at a tent sale or on the secondary market. IMPORTANT: To maintain the machine's warranty and reduce the risk of electrocution, severe burns, or death, the 440V conversion procedure must ONLY be performed by an electrician or other qualified service personnel. Q: If this machine is converted to 440V, will it be able to operate on 480V? A:Yes, this machine should have no problem running at plus or minus 10% of its voltage rating. In other words, from as little as 396V to as high as 484V. Keep in mind, however, that running the machine at the low-end of this voltage range will increase the overall operating temperature of the motor and all its components.